****There are currently NO exchange slots available for this program. You must apply as a direct enroll study abroad student. To learn what this means click here. Please contact studyabroad@umb.edu for questions. 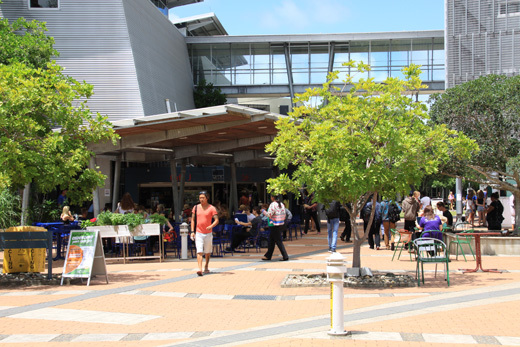 The University of the Sunshine Coast (USC) is one of Australia’s fastest growing universities. Since its opening in 1996 it has grown to service around 10,000 enrolled students and about 10% of these are international. We have a proud record of achievement in learning and teaching, being the only public Queensland university to consistently earn five stars for teaching quality in the The Good Universities Guide 2015. Read a guide for international students. Adjacent to a Mooloolah River National Park, USC’s environmentally sensitive Sippy Downs campus is located approximately 90km from Brisbane city; only a short drive from the Sunshine Coast's major centers and some of Australia’s best beaches and national parks. The modern buildings are fully-equipped with the latest technology, students will find sport and health facilities, cafes, a large library, open air study areas and dedicated student services and social spaces. With resident kangaroos, resort style accommodation, relaxed lifestyle and quality education, USC offers students a unique and ideal study experience. USC offers Study Abroad students the opportunity to choose courses across a range of disciplines from our Faculty of Arts and Business and Faculty of Science, Health, Education and Engineering. Course are offered from introductory to advanced levels allowing students to choose courses in areas that they may not have studied before or to build on prior learning. Please scroll down to "Course Transfers Reference Table" to see how courses from USC transferred to UMB. Students must study full time at the home and host Institutions. With the completion of the Request for Prior Approval of Transfer Credit of Study Abroad Programs form, your credits (not grades) will transfer towards your degree at UMass Boston. This form can be obtained from the Study Abroad office. University of Massachusetts students only. Undergraduate, graduate, and post graduate students who have currently completed at least one year of full-time study with the most recent semester completed at UMass Boston are eligible. Students must be in good academic standing (at least 2.75 GPA) with no disciplinary problems. Umass Boston’s Reciprocal Exchange programs are based off reciprocity with partner institutions, meaning exchange slots are limited and vary by semester. Please check with the Office of Global Programs in advance for additional information. Please note, the Office of Global Programs use estimated price values for our Umass Boston Reciprocal Exchange’ budget sheets. Actual prices may vary, please contact your program provider for more details. There are a variety of housing options, including student accommodations next to campus, private rentals, and homestays. Varsity Apartments offers the largest student accommodation for USC students. Students who are U.S. citizens must apply for a Student Visa (subclass 500). The application is available online through the Australian Government Department of Immigration and Border Protection website. Some visas can take several weeks to obtain. Make sure you understand the requirements for your specific visa. USC provides a start guide, which includes a lot of useful information on preparing for your tip in Australia.This includes a section on visa applications. Please see the start guide here.